Unleash the full potential of your high-speed memory cards with the LUPO USB 3.0 card reader. 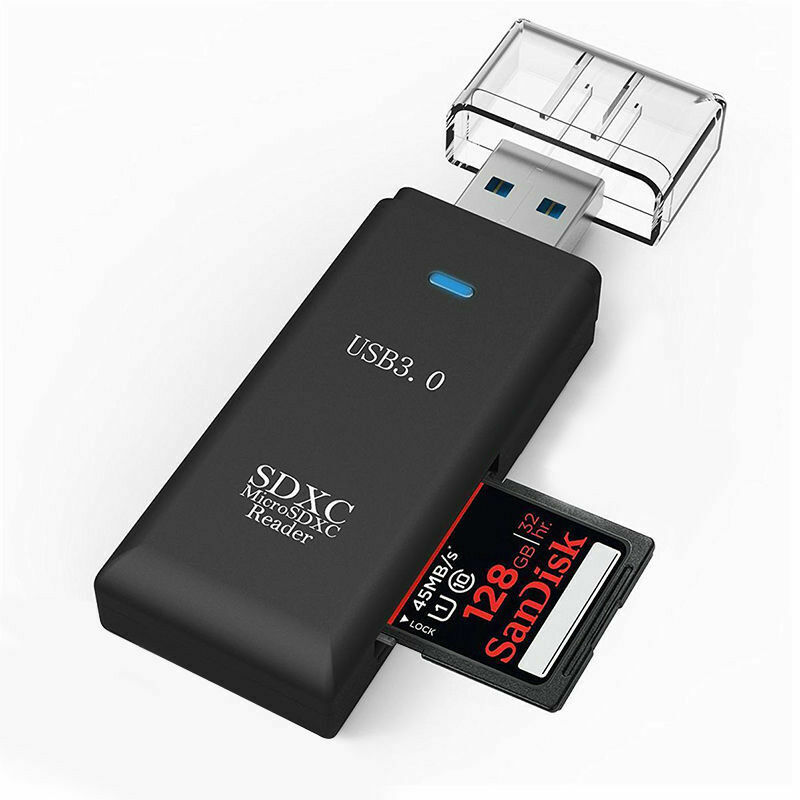 Wide compatibility supports SD, SDHC, MMC, RS MMC, MMC mobile, MMC micro, SDXC, Micro SD and T-FLASH cards, combined with the performance boost of advanced USB 3.0 technology make this the professional's choice for fast and efficient data transfer. Do you demand the fastest data transfer speeds when transferring high definition images and video between devices? Rather than bulky, wired card readers would you like a super convenient, all in one solution? If so, our USB 3.0 Multi Card Reader is the perfect choice! Ideal for seamless music, high definition video and high resolution image transfer, our Card Reader is equipped with plug and play USB 3.0 technology for transfer rates of up to 5 Gbps together with full, driverless USB 2.0 and 1.1 backward compatibility, eliminating long data transfer times! Perfect for active users, our Card Reader measures just 8.9mm thick, and is supplied with an ultra protective USB cap, allowing you to simply slide into your notebook or tablet's sleeve without bulk or weight, and fully supports SD, SDHC, MMC, RS MMC, MMC mobile, MMC micro, SDXC, Micro SD and T-FLASH cards without extra wires or adaptors! Our Card Reader is a premium product with a number of key features: - Wide compatibility supports SD, SDHC, MMC, RS MMC, MMC mobile, MMC micro, SDXC, Micro SD and T-FLASH cards. - Compatible with USB 3.0, 2.0 and 1.1 plug and play ports. - Ultra portable, lightweight design, just 8.9mm thick. - Driverless and USB port powered, no extra cables or wires. - Convenient, LED transfer light prevents corrupted cards and lost data. Technical Details USB MULTI CARD READER - with ultra fast USB 3.0 transfer speeds, wide memory card compatibility and an ultra compact design, our USB 3.0 Card Reader is the perfect, all in one card reader for busy professionals and everyday users! USB 3.0 COMPATIBLE - designed with ultra fast, plug and play USB 3.0 transfer tech, offering up to 5 Gbps data transmission speeds, ideal for transferring music, high resolution images or high definition video seamlessly between devices. Fully backward compatible with USB 2.0 and 1.1 ports without driver downloads! WIDE CARD SUPPORT - forget bulky adapters and easily lost card converters, our USB Reader offers instant, all in one, hot swappable support for modern memory cards including SD, SDHC, MMC, RS MMC, MMC mobile, MMC micro, SDXC, Micro SD and T-FLASH! SLEEVE FRIENDLY DESIGN - all in one, ultra portable, lightweight design measures just 8.9 mm thick, together with a tough, protective USB cap, ideal for carrying in ultra slim laptop, notebook and tablet sleeves without wires or bulk, for easy card access on the go! LED DATA INDICATOR - equipped with a high-visibility LED data transfer light indicating data transmission activity for super safe card insertion and removal, making corrupted data and damaged cards a thing of the past! Click the Orange Button to order now! If you're tired of cheap, bulky card readers and slow data transfer rates, our Card Reader is the perfect, all in one solution combining super fast USB 3.0 technology, ultra wide card support and a light-weight, super compact design! - Plug and in, hot swapping technology. No need to install driver. - 6 card reader slots including CF/MD,SD/MMC, XD,TF,M2,MS. 1*eSATA, 1*USB3.0, 2*USB2.0, 1*USB type-C ports. Transmission Rate: USB3.0, up to 100MB/s. eSATA, up to 500MB/s. M2, MSO, SD,XD,CF up to 10-20MB/s. 1. Logging out the Card Reader before you turn off the computer. Or it will take longer than usual to shut down. 2. The Card Reader support only one memory card at the same time.